Breaththelast: contagious and sick, a sad memory of the unfortunate "Colectiv" — Inertia Movement - 100% Independent. We write the stories. Breaththelast: contagious and sick, a sad memory of the unfortunate "Colectiv"
For the latest few years now I have been living in glourious self-indulgence: I did not take any time to listen to music albums more than 3-4 times. It changed though in early 2018, with the new material from Breathelast the shark quintet. Their first long play album contains 14 tracks produced over the past 3 years. Joined by producer Marius Costache from Studio148 the metal rockers have succeeded something magnificent, with contributions from director & photographer Miluță Fluieraş and graphic designer-musician Alexandru Daş (whom you can listen to in his band Valerinne). The collective produced an eclectic and versatile disc (heavy metal, punk, grindcore and melodic death with some ambient interventions) you won't be possibly bored with (not the first time, not the tenth or 20th). It triggers memories of the Colectiv Club tragedy, however it was written before the sad event which marked the Romanian music landscape and our lives. It is a contagious and sick song in the pure sense of the word and it vibrates powerfully in me. I did not even feel when the 50 minutes of recorded materials went away. All I knew is that I want to play it again like in a montagne russe. It is a sonic eruption that carries a strong visual identity close to an organic radiography, with emphasis on metaphors of skin and bones. 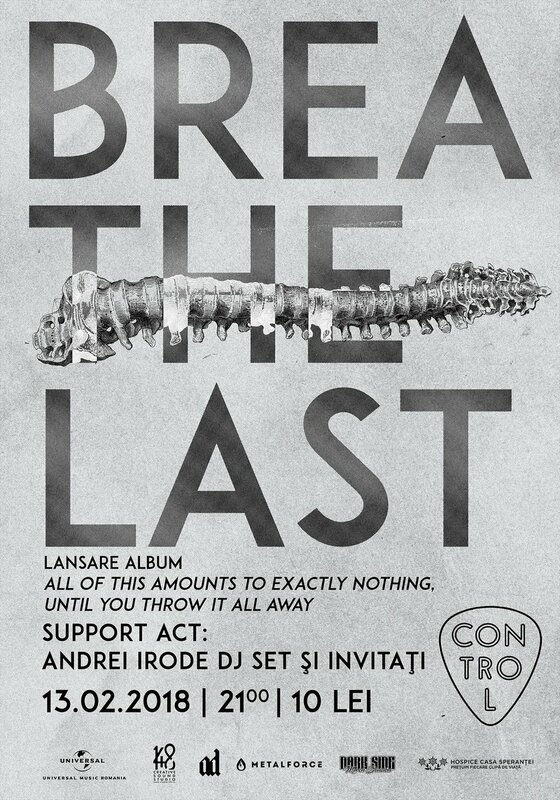 The poster of the album event launch benefits from a splendid visual of a spine and great typography. Likewise the art of the album, which I can’t wait to hold in the my hand (the CD) contains photographic collages with Daș remixed Miluţă portraits, taking the form of overlapping fragments of skin and bone in osmosis. Congratulations on the post-modern typography, it is perfect for a band in 2018 and makes the material a precious artefact. The poster of the album event launch benefits from a splendid visual of a spine and great typography. This conceptual album enters under the skin one song at a time. It has two songs in Romanian "Oase" (Bones) and "Infern" (Hell), and among the 12 tunes in English are the superb "A Million And One", "At Your Funeral" and "Valor of Knife Deep Conversation" which is the opening song. "Infern" triggers memories of the Colectiv Club tragedy, however it was written before the sad event which marked the Romanian music landscape and our lives. It is a contagious and sick song in the pure sense of the word and it vibrates powerfully in me. "Road To Your Grave" is like a slow interlude, one of the two minimalist jewels of the album, with little distortion, but destroying and reverberating in the body and soul. The very groovy electric bass from "Gutter Anthem" leaves is astonishing and "Unsung Foes" probably has the best balance of a piece with a heavy metal sound. You could describe "All That Amounts Exactly Nothing, Until You Throw It All Away" as schizoid (but this is something that art is maybe) with complex rhythms and passages collapsing and forming the structures of the songs. Everything is synced with the visual identity that augments the record. Ross Robinson pulled out the best out of the band "At The Drive-In" on their "Relationship of Command" album, and Marius Costache is also making the most out of it. He can be felt searching for every opportunity to highlight and point out the record’s instruments or the vocals. In his musical project with "Fane and Para", "Environments", he has an incredible talent of highlighting the silence and air between melodies and tracks. 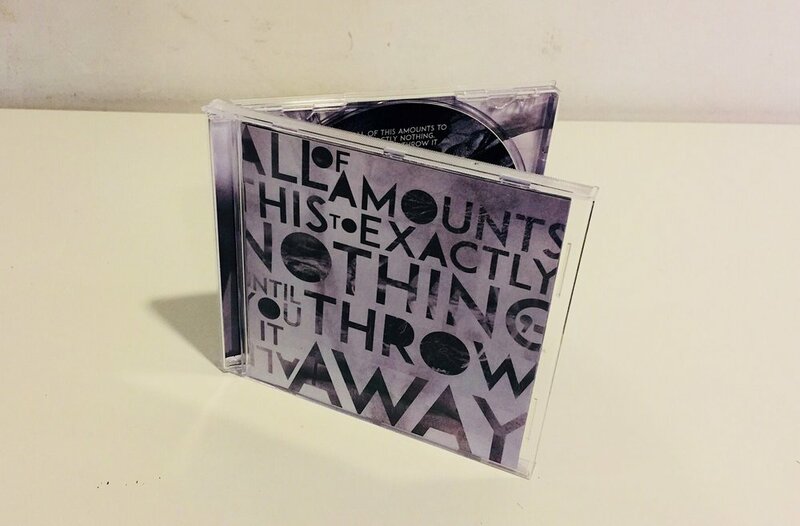 Similarly on "All the Amounts Exactly Nothing, Until You Throw It All Away", creates space between melodies and harmonies (Infern has only 2 guitars and the vocals), between distortion, hard beats and structures with many syncopated parts seem to just breathe. Just notice the transgression to ambient moments, on tunes like "Heartless Arsenal" and "The One Where We Bury Our Past". The quiet follows the storm - a silent monument. Brendan O'Brian made the same thing with bands such as Deftones and Incubus where each new and album had a unique approach, quite independent in the band's discography. Sometimes for Incubus, it was radically different as genre too, going from nu-metal to hard rock, pop rock and folk. This time from a metalcore band, Marius takes out fine textures and sculptural sensibilities that are visually synchronised with the Fluieraş-Daş art. It is always clear when a band matures in time and this is the case, eight years later in the Breathelast timeline, the new record is a mark or even a pillar of perseverance and insistence (perhaps even stubbornness) with revelatory results: a masterpiece, a premium quality artefact. Mihai, Hertzu, Aditza, Vali, I0 Nut I bow down with respect! "At Your Funeral" is the kind of composition that writes a script in your head and then awaits the transformation into a sophisticated, efficient trip. "The Bridge" is the kind of song I'd like to hear on genre radios like RockFm. And I hope this is turns out as a prophecy! 1. It is important to talk about what will follow. 2. days will come hard on us, but there will be good days too. 13. with forgiven and close enemies. 14. despite all, history will repeat itself. Looking forward to join us at the album launch concert of this shark album in Club Control on February 13, where Andrei Irode will perform with dear guests and will have the premiere of their new video. It is always clear when a band matures in time and this is the case, eight years later in the Breathelast timeline, the new record is a mark or even a pillar of perseverance and insistence (perhaps even stubbornness) with revelatory results.